Honda motorcycle books cover the history, racing, Mr Honda himself and dozens of manuals for all Honda motorcycle models. Honda, founded in 1948, is the world's largest manufacturer of motorcycles. Soichiro Honda's first motorcycle, the Honda Cub, marked the beginning of Honda Motor Company. The Illustrated Motorcycle Legends: Honda by Roy Bacon (1995). This pictorial history of the Honda motorcycle takes you from the early days of 1906-1956 through the Twin cams, Turbo, Small Fry, all the way to the Retro bikes of the early to mid 1990s with the Revere and Transalp. The Illustrated History Of Honda Motorcycles by Roy Bacon (1995) covers the history from the launch of the first scooter in 1958, for basically the next 40 years. Honda: The Early Classic Motorcycles : All the Singles, Twins And Fours, Including Production Racers And Gold Wing 1947 to 1977 by Roy Bacon (1997). The story of the most sought-after Honda motorcycles ever built. Covers classic Hondas from the 1977 Goldwing all the way back to 1946 when Honda originally built clip-on engines for bicycles. Covers every production single, twin, four and racing bike. 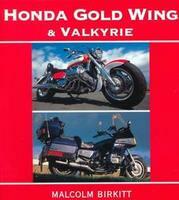 Honda Gold Wing And Valkyrie by Malcolm Birkitt (1999). In 1974, Honda took the wraps off a 1000cc flat four with shaft drive and water cooling, and the Honda Gold Wing was born. Renowned photographer Malcolm Birkitt has included coverage of Honda's dynamic, new Valkyrie in this update of his best-selling Honda Gold Wing title, as well as examining all the changes in the Gold Wing since 1995. Included are intriguing early design sketches and portraits by Honda's designers and engineers. Honda: The Complete Story by Roland Brown (1998). Honda is one of the largest and most important manufacturers of motorcycles in the world. This book traces the company's development through all the major models, from the pedal cycle that marked the firm's debut in 1946 through to the powerful superbikes of the 80s and 90s. Topics covered include: all innovative machines; Honda's successful racing record; and a full company history. The Story Of Honda Motor Cycles by Peter Carrick (1976) reflects the unique role of Honda in the history of motor cycles, capturing the driving energy, outstanding vision and total dedication which, within a little more than a decade, made Honda the biggest manufacturer of motor cycles in the world. Cycle World On Honda 1968-1971 by R M Clarke (1988). Road tests, specifications and new model reports. Cycle World On Honda 1962-1967 by R M Clarke (1995). Road and trail, new model reports and history. Honda CB750 Gold Portfolio 1969-1978 by R M Clarke (1998) contains 38 articles including road test reports on Honda's Super Sport, K2, K3, K5, K6, K7, F1, F2 and 960, from such popular magazines as Cycle World, Motorcycle and Motorcycle Mechanics. Plus articles on new model reports, performance data, history, service notes, engine analysis, specs and tuning. Honda Gold Wing Gold Portfolio 1975-1995 by R M Clarke (1998) contains 48 articles including road test reports on 1000, 1100, 1200, 1500/6, Interstate and SE, from such popular magazines as Cycle World, Motorcycle and Motorcycle Mechanics. Plus articles on new model reports, performance data, history, service notes, engine analysis, specs and tuning. Honda CBX 1000 Gold Portfolio 1978-1982 by R M Clarke (1998) contains 29 articles including road test reports on CBX Super Sport, Z, A, B, C, and Moto Martin, from such popular magazines as Cycle World, Motorcycle and Motorcycle Mechanics. Plus articles on new model reports, performance data, history, service notes, engine analysis, specs and tuning. Honda CB750 by Mick Duckworth (2003). Launched in 1969, Honda's first four-cylinder roadster revolutionized the motorcycle market, setting new standards of sophistication, user-friendliness and reliable high performance. Honda: The UK Story by Eric Dymock (1995). 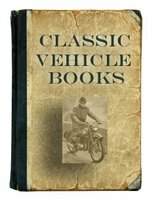 Written by the wellknown motoring correspondent Eric Dymock, and published to celebrate 50 years of Honda. This history covers bikes, cars, generators and also quite a bit of Formula One motor racing! The book also looks at the sensation caused when their motorbikes were imported to the UK in 1965. 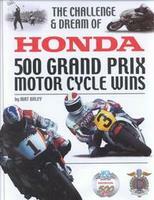 The Honda Story: Road And Racing Motorcycles From 1948 To The Present Day by Ian Falloon (2005). After the nightmare of World War II, Soichiro Honda and Takeo Fujisawa created the dream. This was followed by the Benly and Super Cub, which led to a series of twin-cylinder motorcycles including the Super Hawk and CB450. Today, through a marriage of engineering brilliance and astute marketing, Honda has become the world's largest motorcycle manufacturer, dominating both the racetrack and showroom. It is an extraordinary story, told here with particular reference to the top road and road-racing models. Honda Motorcycles: A Complete Maintenance Guide Covering All Models From 1960 by Graham Forsdyke (1967) covers models between 1960 and and 1967 from 50cc to 450cc. 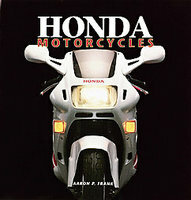 Honda Motorcycles by Aaron Frank (2003) is the foremost account of the history of Honda. The result of $3,200 and a dream in 1948, The Honda Motor Company has become synonymous with innovation and quality and leads the world in motorcycle technology. With every passing year and each new model, the Honda name becomes even more prestigious in the motorcycling world. The world of Honda and motorcycle enthusiasts both crave a comprehensive look at these bikes and the company that produces them and this outstanding chronicle offers a truly remarkable perspective of more than fifty years of Honda's prowess. Honda Toute L'Histoire by Didier Ganneau (1987). The story of Honda. French text. 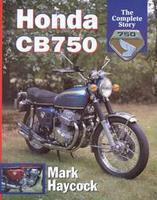 Honda CB750: The Complete Story by Mark Haycock (2000). As the first modern motorcycle to combine speed and reliability in an affordable package, the Honda CB750 is one of the most significant motorcycles ever built. A valuable resource for anyone who owns, has owned, or wants to own one of these increasingly collectible bikes, this model history is replete with design and development history, in-depth technical analyses, full specifications and superb photo illustrations. 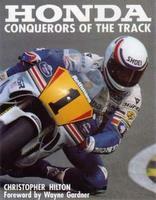 Honda: Conquerors Of The Track by Christopher Hilton (1990). Dramatic and engrossing picture of how Honda, and those who rode their machines, stamped their authority on bike racing over a thirty year period. Honda: The TT Winning Years by Peter Kneale & William Snelling (1998) chronicles the 95 TT wins that Honda has gained since 1961. 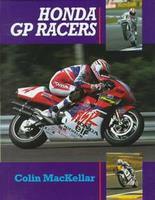 Honda GP Racers by Colin MacKellar (1998). The history of Honda motorcycles is inextricably linked to racing, and many of the features that find their way onto street machines are developed on the track. Concentrating on the period from 1978 to the present day, Colin MacKellar starts with Honda's decision to return to Grand Prix racing and, in turn, studies the successes and failures of Honda's 125c, 250cc, 500cc, and 750 cc models from the perspective of key personalities. A detailed and entertaining history of these respected racing machines. 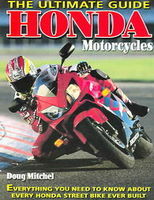 Honda Motorcycles: The Ultimate Guide: Everything You Need To Know About Every Honda Motorcycle Ever Built by Doug Mitchel (2005). The full story of Soichiro Honda's innovative approach to motorcycle design, performance data and options for every model from the collectible 750-Four and Super Hawks to today's CBX models, as well as up-to-date collector values are included in this must-have guide. 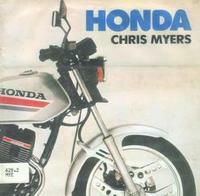 Honda by Chris Myers (1984) covers history, road-going lightweights, road-going middleweights, road-going bigger bikes and superbikes, sporting bikes and star riders. Honda Gold Wing An American Japanese Motorcycle by Peter Rae (1984) traces the history and rise in popularity of the Honda Gold Wing motorcycle in America. It became a cult motorcycle, a long distance tourer, that creates a fellowship amongst its owners. Honda Motor: The Men, The Management, The Machines by Tetsuo Sakiya & Timothy Porter (1982) is a guide to the history, products and personalities of Honda Motors. Honda: The Man And His Machines by Sol Sanders (1975). Born into the family of a poor blacksmith and bicycle mender, Honda was from his earliest days fascinated with 20th century technology, in particular with motors and motor vehicles. By attaching surplus gasoline motors to bicycles, he founded the Honda Motor Corporation. The author brings fascinating insights into contemporary Japanese business and culture. Honda: An American Success Story by Robert Shook (1988). The true story of one company's unique integration of Japanese and American manufactuing, marketing and management styles. 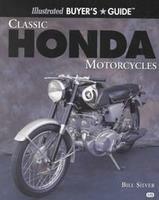 Classic Honda Motorcycles by Bill Silver (2000). This illustrated buyer's guide gives prospective buyers a leg up on the current market for classics like the CB77 Super Hawk, CB92 Benly, Dream 300, CB750, CB 400F, as well as 1970 to 1979 models that are quickly becoming classics in their own right. Photographs of the models are accompanied by complete descriptions of specifications, components, paint codes and serial numbers. A five-star rating system rates the bikes on collectibility, parts availability, two-up touring compatibility, reliability and power. Highlights common repair and restoration needs and looks at future collectible models. Honda CBR900 Fireblade by Rob Simmonds (2001). The appearance of Honda's CBR900 in 1992 rendered the then-current crop of superbikes obsolete, thanks to its potent and unbeatable mix of light weight and raw power. This unique volume takes you full circle, from previously unpublished preliminary design sketches, to an in-depth technical look at what makes the 'Blade so special, to what a stunned press thought of its awesome mix of handling and power, up through the Fireblade's racing successes. Contains in-depth interviews with the men who made the 'Blade happen, what to look for when buying a used machine, and how to tune it for increased performance. The Book Of Honda (1960 To 1964 Models) by John Thorpe (1965) is a guide to the handling and maintenance of all models up to 1964. Gold Wing: The First 20 Years: Twentieth Anniversary by Ken Vreeke (1994) is the real story of this marque from the factory. Mock ups, prototypes, show bikes and all production models are shown. Also the thinking from both the engineers and Mr. Honda himself on the directions this model should go. Honda by Mick Walker (1993) contains the following chapters: Early days, Black bomber, CB750 - the original superbike, Racing, CD Series CB400F- Euro special, First 4-valve - and a bland best seller, Gold Wing, Off-road, Vee twins, Vee fours and Transverse multis galore. 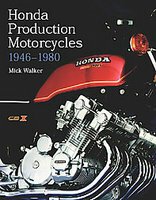 Honda Production Motorcycles 1946-1980 by Mick Walker (2006). Founded not long after World War Two, Honda quickly grew to be a very successful company, manufacturing motorized vehicles and equipment. Perhaps its biggest impact has been caused by its motorcycles, which through their economy, good design and excellent performance severely affected the once-dominant British motorcycle industry and built up an enthusiastic following across the world. 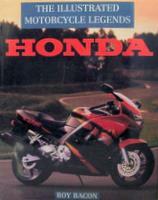 Classic Motorcycles: Honda by Hugo Wilson (1998). Featuring world-famous motorcycles from the 1960s to the present day, Honda is the ideal pocket-sized guide for identifying these legendary bikes. Honda by Mick Woollett (1983). A companion for the Honda enthusiast and a full and authoritative history. Road tests, models and prototypes, technical aspects, archive material, racing, trail bikes, road-cruisers, mopeds etc. Numerous B&W and colour photographs, technical specifications, and engine diagrams. Honda Motorcycle Ad (1966) Honda motorcycle ad from Life magazine published April 9 1966. 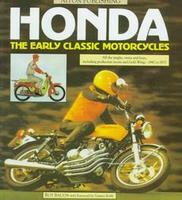 First Into The Future (1978) Honda Motorcycle CX-500 full-colour sales folder. On cover, bike at speed rounding a bend. Specifications of this V-Twin bike on outside back panel.